In keeping with my efforts of being an unconventional bride, when Malcolm and I started talking about rings, I knew I didn’t want a diamond. I wanted a beautiful ring, but I didn’t want a ring that looked just like everybody else’s. I also didn’t want to spend a huge amount! I also wanted to be sure we were getting ringS. Yes that’s right, Malcolm got a ring too. It was very important to me that he got a ring just like I would be getting one. It never seemed fair to me that women get rings on engagement but men don’t. The way I saw it, it was only right that we both got rings and we both shared the cost for those rings. Malcolm has since said that he really likes having a ring as a way to show the world that he’s very serious about our relationship. He also likes having the ring because we’re going to be apart for a year before we can get married. I didn’t realize how important the ring would be to him, but he’s so careful with it and always makes sure he wears it. When picking out a ring for Malcolm, we first started looking at jewelery stores in Glasgow. The costs were extortionate and Malcolm never really found something he loved. So instead, we headed to Etsy! I don’t have one of Malcolm wearing it, unfortunately, because I’m just not that organized! 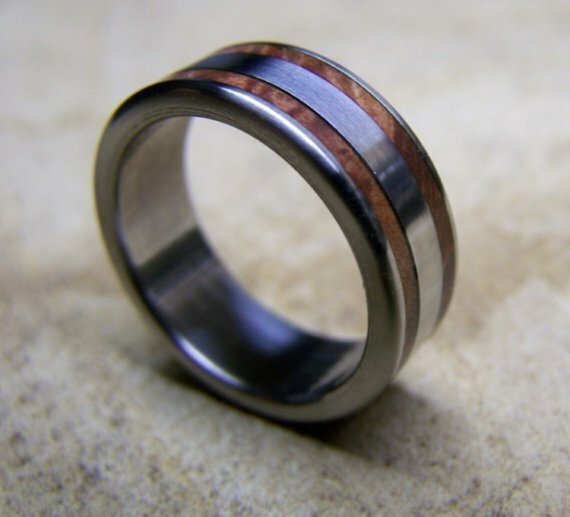 This is a titanium ring with Manzanita wood inlay. This was especially meaningful for us because my family has a house in Manzanita, which is where Malcolm and I first discussed marriage. We bought this ring from robandlean on Etsy. Malcolm loves it! My ring was more complicated. I knew I didn’t want a diamond and I was leaning towards a princess cut stone with surrounding diamonds. I had an idea of what I wanted, but didn’t know exactly which kind of ring. We started looking in Glasgow and pretty quickly deduced that we’d have to get a ring custom made to get the exact one that I wanted. 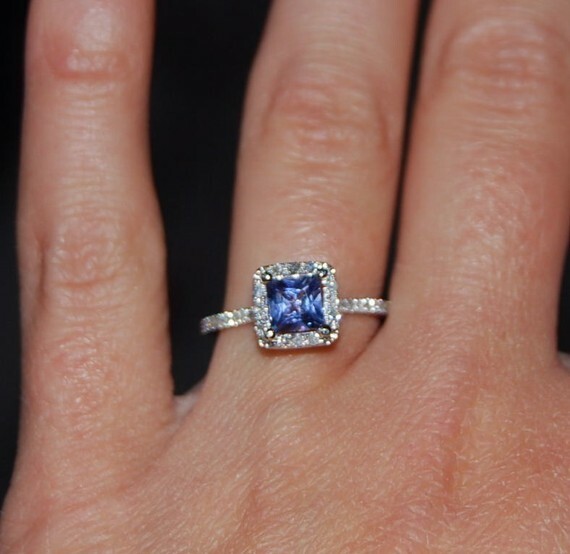 I decided that I wanted a light colored Tanzanite stone with delicate, small diamonds surrounding. We got an estimate for a custom made ring from a local jewelers and I almost choked: $2,750! We had a budget of $1000, so that was a no go. Soon we headed back to Etsy and found two possibilities for custom making my ring. The first place we tried quoted $1,450. Better, but still too much for us. Finally I found a woman who would make the exact ring I wanted for $950! Result! I LOVE IT. It is exactly what I wanted and at the right price! The only bad thing was that I bought the ring back in August but didn’t get it until I moved back home in October. I didn’t want to have the ring sent to Scotland because of customs charges, so I had it sent to my parents’ house in Portland. Then, when I arrived home, I noticed that one of the accent diamonds was missing. So back to the designer it went to get the diamond replaced. I’m still waiting to get it back from the designer, but hopefully it will arrive soon. It’s been SO frustrating with LOTS of waiting, but at least I know that the ring is just what I wanted. After my recent problems with Etsy I won’t say who the ring designer is (in case she sends me horrible emails!). However, other than the missing diamond and the slooooow mail to return it and get it back, I’m very happy with my ring. I’m also very happy that I got a ring I wanted without going overboard. I read somewhere that the average cost of an engagement ring is over $3,000, so I’m very happy to buck that trend! We got two beautiful rings that we both love, all for around $1,100. I’m very happy with that! « It costs HOW much?! Love them. LOVE! THEM! So happy for you guys.